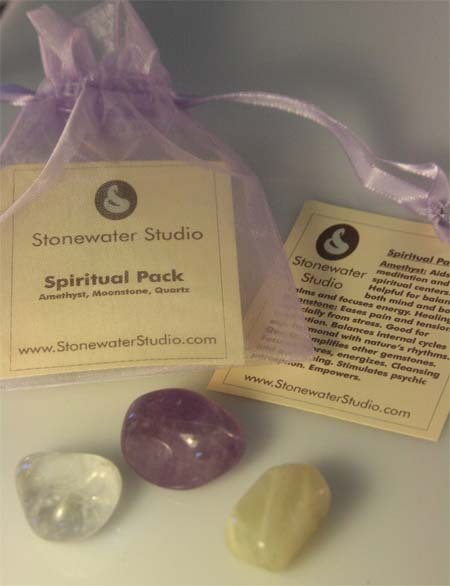 The Spiritual Pack of gemstones combines the healing and balancing benefits of a variety of gemstones. Amethyst aids meditation and opens the spiritual centers; Moonstone balances internal cycles with nature's rhythms and assists meditation; Crystal Quartz amplifies the other stones, cleanses and awakens stimulating psychic perception.. All the gemstones are cleansed (of any foreign energies) and charged in full sunlight. Comes packaged in a handy pouch with details about the gemstones. Great to carry while traveling or place next to your bed stand at night or use in baths or elixirs. Stunning amethyst and pearl necklace with sterling silver accents, enhanced with an amethyst clasp.